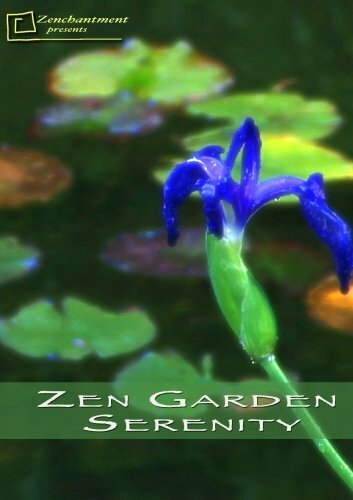 Zenchantment presents Zen Garden - Serenity Relaxation & Meditation DVD, capturing the tranquil beauty and harmony of Zen gardens, scene by breathtaking scene, and is the ultimate deep chill relaxation DVD. A Japanese bridge beckons the viewer to enter into a world of sublime bliss. A bamboo water spout empties endlessly into a pristine granite basin. A gentle breeze sends ripples across a pond. Bonsai trees and Japanese Lanterns (Ishi Doro) are softly sculpted by wind and time. Representational of a larger universe and referred to as “mindscapes,” Zen Garden - Serenity Relaxation & Meditation DVD offers the most tranquil world for inner contemplation. Because of the success of Zenchantment’s original “Zen Garden DVD, Serenity features beautiful new footage and relaxing soundtrack. Transform your personal environment into infinite peacefulness, with one of the most blissful DVD ambient landscapes ever produced - Zen Garden - Serenity Relaxation & Meditation DVD. Shot in high definition, the Zen Garden - Serenity Relaxation & Meditation DVD artfully captures the quiet harmony of some of the country's oldest landscaped Zen gardens. Relaxing natural sounds of water, wind, and birds underscore the meditative scenery. An optional music track utilizing traditional Japanese instrumentation evokes a sense of calm and peacefulness. Enter into a world of inner tranquility and contemplation with Zen Garden - Serenity Relaxation & Meditation DVD . "I can turn our flat screen into a garden window, with Zen Garden DVD. Absolutely Brilliant! "I love my Zen Garden DVD... it puts me in the most relaxing state of mind in minutes..."
Exhale slowly, and let the relaxing sounds and images of this calming Zen Garden - Serenity Relaxation & Meditation DVD gently wash over you, embrace you, and transport you to a tranquil meditative world where the simple movement of a cloud across the exquisitely manicured sand marks the quiet passing of the day. Escape to a world of infinite bliss with the Zen Garden - Serenity Relaxation & Meditation DVD - the ultimate deep chill meditation DVD. Visit www.zenchantment.com for more information about other Zen Garden DVDs. If you have any questions about this product by Zenchantment, contact us by completing and submitting the form below. If you are looking for a specif part number, please include it with your message.